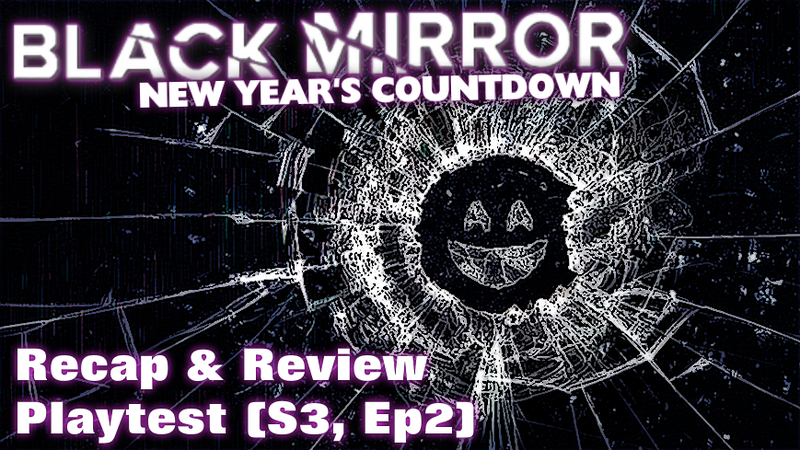 There are five days left in 2016, and we are continuing our countdown with season three of Black Mirror, today's recap & Review is of 'Playtest' the second episode of season three. The Star: Cooper, played by Wyatt Russell: was in such films as Cowboys & Aliens, 22 Jump Street... 3rd generation actor song of Kurt Russell & Goldie Hawn, grandson of Bing Russell. Character: Cooper is a guy who goes on a trip to see the world, feeling he's unable to connect with his mother after dealing with his father dying and having Alzheimer's tech. During the course of the episode his mother keeps calling but he avoids taking the call. 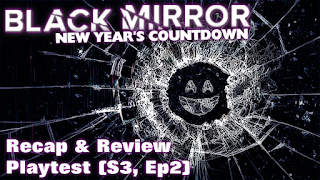 Friend In London: Sonya (played by Hannah John-Kamen, who was Selma Telse inBlack Mirror Season 1 episode Fifteen Million Merits) meets Cooper in a bar, they hit it off, she's a tech journalist. 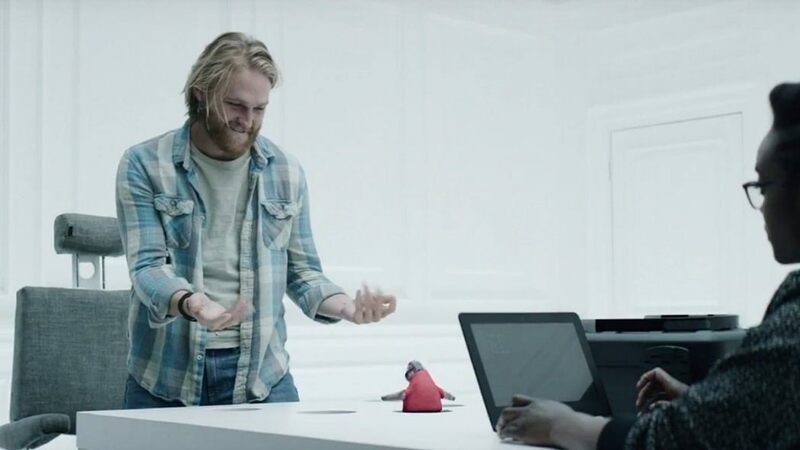 The Tech: In an era were Virtual Reality is becoming fairly common place, in this episode of Black Mirror sees that the 'next era' is being reached for, with an implant that learn from a players mind to 'try and scare him', though focused on the survivor horror genre in this episode, I have seen games that learn to adapt to a players play style. The story: Cooper goes on a world wide trip to find himself and on the final leg of his trip learns that his credit card number was stolen and he has no money to get home. A friend he meets, Sonja' points out a job for a video game company on an job app he's used on his journey whenever cash was tight. Cooper goes signs up and also hopes to get Sonja a picture of what is being developed, though his phone and taken and turned off. He turns it back on to send Sonja the pic of the tech that is being developed, before it's planted in the back of his skill during which time his mother calls, but the call is quickly cancelled. Cooper's first 'test' of the tech is to play a virtual game of Whack-A-Mole, though only he can see it, he's then taken to the guy who runs the game company named Shou, who wants to take it the next level for a fear based game, Cooper is happy to take part. He is taken to a mansion that served as the bases for a game he's familiar with and he starts experiencing a few jump scares, such as spider, a bully from high school, and then Sonja shows up... thinking she's part of the illusion, he doesn't believe her when she wants to get him out of there... and is then attacked by her... it turns out it was part of the tech programming, but Cooper as had enough and wants out. Which leads to the episodes multiple endings, the first being he's told to go to an access point but his memories fade and he ends up experiencing a Alzheimer and is to be taken to where other failed test subjects are held... then he wakes up, he's in the room where he got second test began, he leaves and goes home only to see his mother has developed Alzheimer's... And then the truth is revealed that Cooper died when his mother called after he was implanted with the tech, the phone signal interfering with with the tech, and his last were to 'call mom'. Overall: A very find episode, but pretty weak as there is no 'moral', just showing the dangers of signing up for 'beta testing and also to 'call you mom', you never know when a call might come through at a bad time.